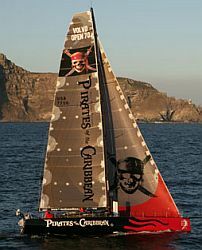 The 7th leg of the Volvo Ocean Race round-the-world yacht race has been going on for a week. They left New York headed for Portsmouth, England - a distance of about 3300 nautical miles. You can download the Volvo Ocean Race file now and see the history of the previous four legs and watch the LIVE race in Google Earth. Meanwhile, Dee Caffari on Aviva is about to complete her solo round-the-world against the prevailing winds record attempt in Southhampton, England late today. See my story about her Google Earth track, and the Aviva Challenge web site for details on her arrival. I love this view! Plotting real time locations of vessels (espeicially races) is one of the coolest applications I think for this new mapping technology.